Um Peão para Qualquer Obra – Perfil do Cessna 208 Caravan I; FIDAE 96 – A Aviação se Encontra em Santiago; Os Tiger Afiam Suas Garras – A FAB prepara a modernização de seus F-5E/F; A Flecha de Poti – Missões com os Esquadrões do 2º/8º GAv; Os Olhos dos Pracinhas – Com a 1ª ELO na Itália; Fulcrum! – Um Jambock Voa o MiG-29; Fleet Air Arm – Um Dia com os Pilotos da Marinha Real; Salvando e Lutando sobre a Cidade Maravilhosa – Operações do CGOA (Coordenadoria Geral de Operações Aéreas); Operação Ópera – Ataque ao Reator Nuclear! ‘Vruum’ was a pop culture magazine from the 1970s. Aimed mainly at teenagers, it brought stories about cars, airplanes, motorcycles, boats, the most varied types of vehicles, in a super modern graphic design for the time. First issue launched April 1976 or 7 June 1976 (sources differ). Published fortnightly until issue no.6, after which it ceased publication. ‘Tecnologia & Defesa’ magazine was introduced in the Brazilian market in March 1983 by a group of journalists specialising in the Defense and Aerospace areas, being the oldest publication of its kind in circulation in Latin America. The publication covers all areas of military technology, defense, and public security, special emphasis being given to the coverage of international exhibitions. Every issue comprises special interviews with top military, government, and industry personalities. Special Editions are also regularly published covering specific areas of historical, technological, or political interest. Published quarterly. From Issue 28, the Portuguese-text magazine ‘Manche’ was taken over by a new publisher and renamed ‘South American Aviation News’, with English-only text and expanded to 24 pages average. It remained a bi-monthly South American aviation enthusiasts magazine. A5 size, with b+w photos and centrespread drawings. Each issue included news, registrations, articles on (mostly Brazilian) airlines and Air Force units. Ceased publication about a year later. Quarterly magazine dealing with military and defence topics, including military aviation. Monthly Magazine dealing with flight safety. No further information. Further information: Rua Barao do Rego Barros 623, Cep. 04612-040 Sao Paulo, SP – Brazil. Telefax: 55(11)535-0335. Subtitled ‘A Revista Brasiliera de Aviacao Militar’. 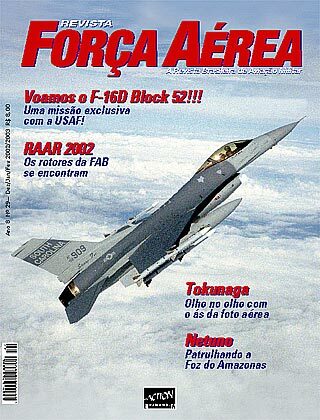 Official magazine of the Brazilian Air Force. Published quarterly from 1996. Issue 31 was dated June/July/August 2003. Glossy, well-illustrated A4 size magazine covering all aspects of FAB aviation. Includes some coverage of military aviation in other countries.